This has been a slow-going modification because it took quite a while to get around to it. I mounted a leftover Triple Strike blast chamber to the front recessed area. It's triggered by a directional control valve. Internally I replaced the flow/speed control valve with a coupler and replaced the tubing between that part and the trigger. I then linked the triple strike in with the rest of the tubing. 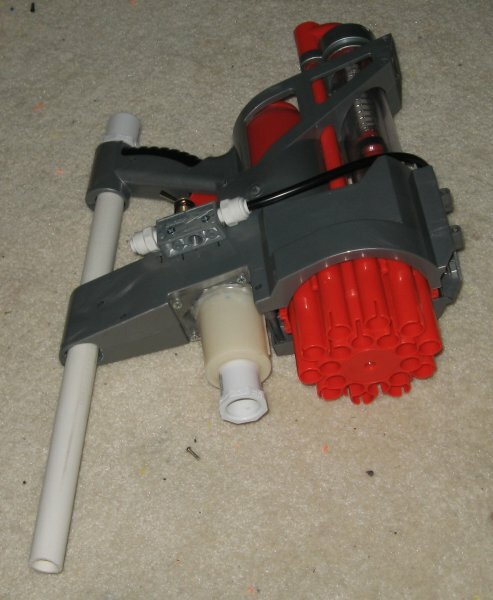 The 1/2" white PVC pipe is just to reinforce the gun and add a forward handle. The triple strike blast chamber has a 3/4" to 1/2" adapter glued to it so I can use a flip-around clip. I need to up the pressure output on the regulator to use this gun. I also need to replace the RF20 barrels with PETG. Edited by CaptainSlug, 04 June 2007 - 09:53 PM. Edited by Chewbacca, 04 June 2007 - 08:25 PM. This (and most of my other guns) are setup specifically to be used with my external tank. Which you can see me wearing in the video. "BOB" because I removed so much of the gun and as an homage to pure evil (Twin Peaks reference). Edited by CaptainSlug, 04 June 2007 - 08:24 PM. Yes, I saw that, and thats why I edited my post. Man, I feel so stupid for not seeing your external tank. Anyway, great mod/integration. Edited by Chewbacca, 04 June 2007 - 10:00 PM. I really like that it will be hooked up to your backpack-tank, and that you never have to reload in a round of warring (unless you're using your Titan or something that takes alot of air). Man, I love that external tank. It adds so much RoF to all your guns it's rediculous. 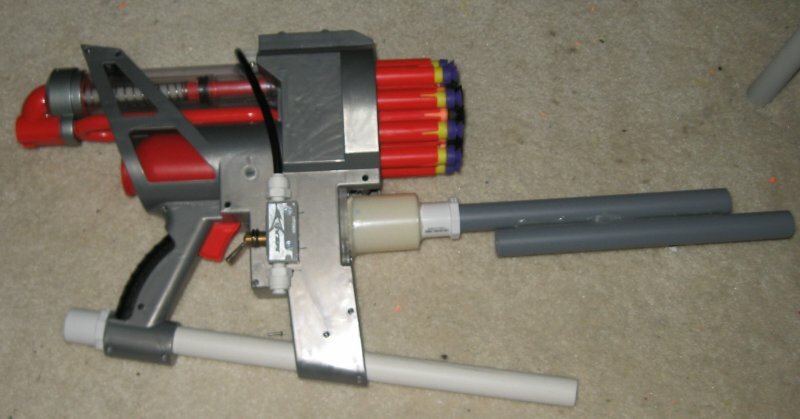 If you clip modded the RF20 and had replacement turrets you'd never be caught reloading. Very clean, neat, and effective integration. I'm curious to see how the ranges will improve with PETG barrels. Looks like you beat me to gettiing an RF20 modded for external tanks. 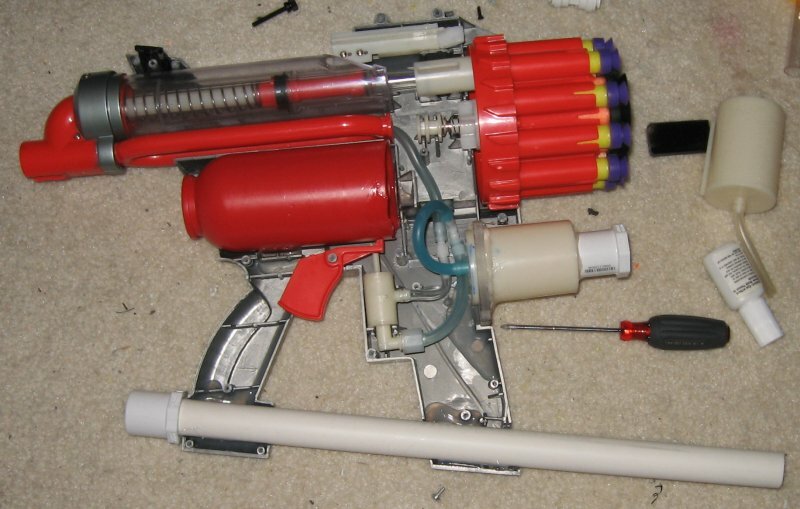 Its funny how you also took out the selector vavle and replaced it with a coupler like I did. One thing I am thinknig might be intresting to try is get a verable flow needle valve and put it in place of the coupler. That way you can more effectivly controll the fire rate of the RF20. Actually I already have one inline on my tank setup I just never think to adjust it. I figured you had already come up with some way to do that. I just thought I would check and see.